Hosting our resident and winter-visiting birds is always fun here in the Rio Grande Valley. It’s possible to increase the variety of birds coming to your property by planting native trees. You may recognize the mantra, November through February is the ideal time to plant trees in the Valley. Cooler months help trees establish without the stress of summer heat and drought. >> Texas Ebony (Chloroleucon ebano) provides cover, roosting, nesting sites and protection for birds. Flowers attract bees, butterflies and other beneficial pollinators. It blooms in spring and after a rain and can reach heights to 30 or 40 feet. Slow growing. >> Anacua (Ehretia anacua) berries provide food for birds and other wildlife. Blooms offer nectar for butterflies, bees and beneficial pollinators. The canopy is dense and great for nesting and shelter for birds and critters. It blooms most profusely in spring and after a rain. 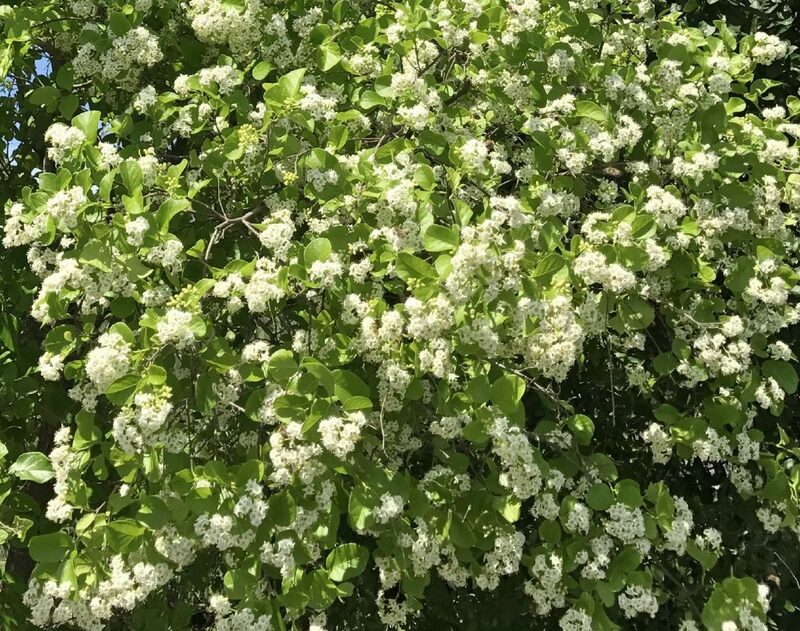 Generally grows between 15 and 40 feet tall. Moderate growth rate. 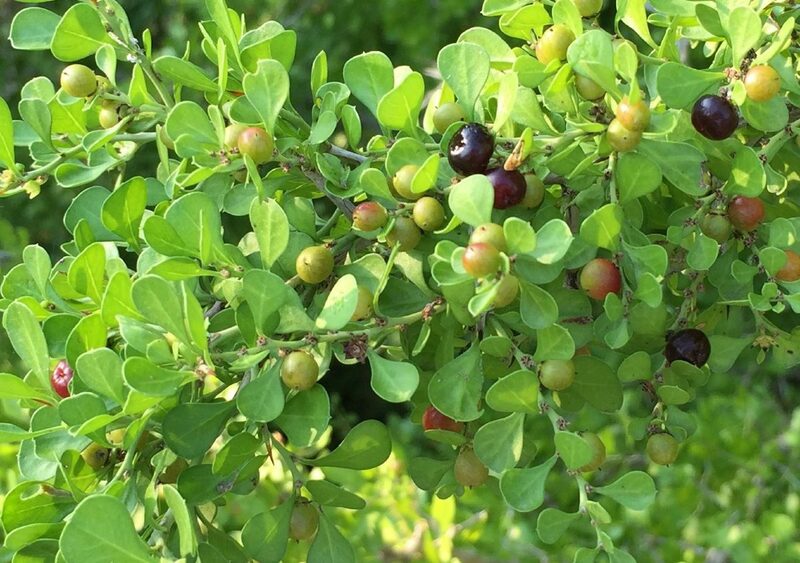 >> Spiny Hackberry (Celtis pallida) and Sugar Hackberry (Celtis laevigata) provide berries for birds. The fruit from both species is edible right off the tree for humans, too. Sugar hackberry, is fast growing and can reach to 50 feet or taller. Spiny hackberry generally grows from 10 to 20 feet and has a moderate growth rate. 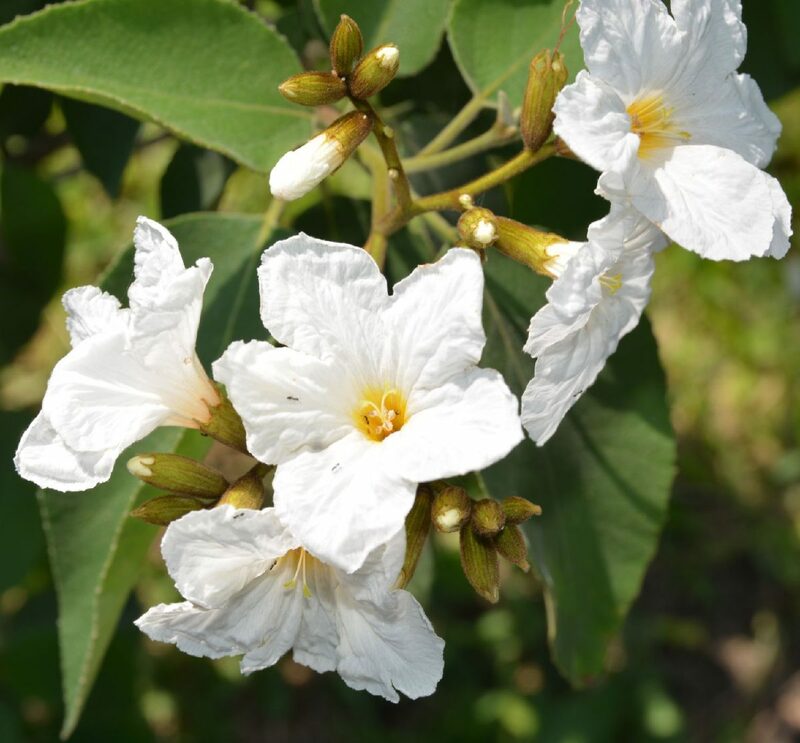 >> Wild Olive (Cordia boissieri) blooms in all seasons providing nectar for hummingbirds and butterflies all year long. 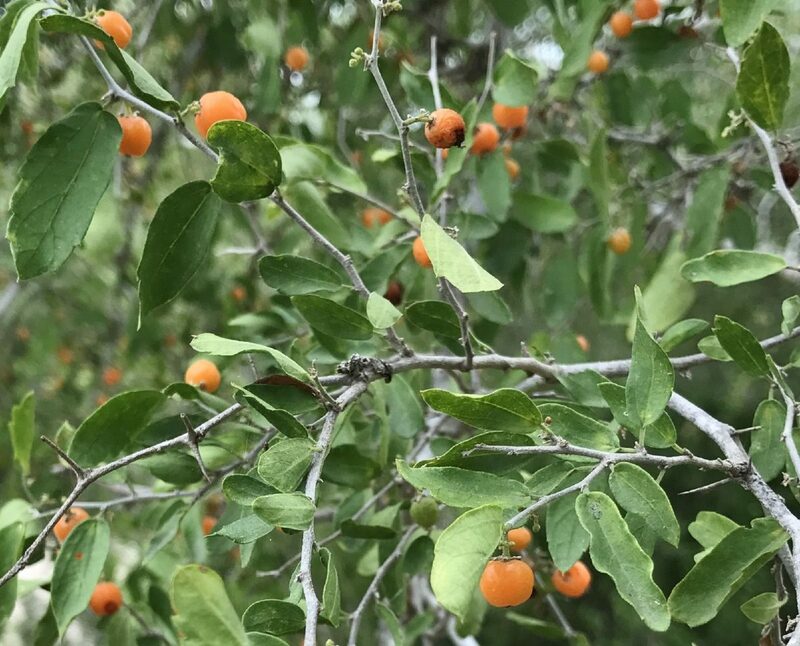 The fruits provide food for birds and wild animals. Lower branches can be left to reach the ground or pruned for a more tree-like shape. Generally 10 to 20 feet in height. Moderate growth rate. >> Mexican Caesalpinia (Caesalpinia Mexicana) can bloom all year. Hummingbirds, butterflies and bees frequent the clusters of bright yellow blooms. Fast growing. Can grow to 19 feet but is usually shorter. >> Brasil (Condalia hookeri) fruits are coveted by birds, quail, coyotes, and small mammals as well as humans. Flowers are a good nectar source. The dense canopy is great for protection to birds and for roosting and nesting. Blooms spring and summer. Generally reaches from 12 to 15 feet in height. Moderate to slow growth rate. >> Potato Tree (Solanum erianthum) is a large-leaved, small native tree with an airy, umbrella-like shape. It attracts an endless number of visitors. Flies, wasps, bees, bugs, insects and a variety of butterflies and moths use the leaves as a resting place. Chachalacas and other birds eat the leaves and the bugs that visit. Stink bugs lay eggs on the leaves and the resulting larvae provide food for birds and lizards. Wasps, bees, beetles and butterflies draw nectar from the ripened fruit when it splits open. It flowers and fruits all year. Clusters of colorful fruit provide fine dining for chachalacas and other critters. Fast growing. It can grow to 10 feet or taller and tolerate rugged pruning to keep it to a size that fits your garden. Visit www.rgvctmn.org for a list of Valley native plant growers.